Rajinikanth and Kamal Haasan, the two icons of Tamil cinema, were the special guests at the platinum jubilee function of Dravida Munnetra Kazhagam’s mouthpiece Murasoli which was held on Thursday, August 10. The event was closely observed by political pundits to see whether the two actors, who have visibly shown interest in entering politics, would give hints on taking a plunge. Although there were no big announcements, the duo has given a few clues on where their heart is lying. Although there were no big announcements, the duo has given a few clues on where their heart is lying. By refusing to share the dais or give a speech at DMK’s function, Rajinikanth has indicated that he is clear about his political plans. The superstar, who had no qualms to talk at the 47th Thuglak anniversary event earlier this year organised by RSS ideologue S Gurumurthy, cautiously avoided giving a speech at the function as his words might put him in an uncomfortable zone if he decides to take a plunge.Generally, Rajinikanth does not shy away from speaking at functions and his stand to sit in a front row rather than sharing the dais with DMK working president Stalin is a message that is not difficult to decipher in words. 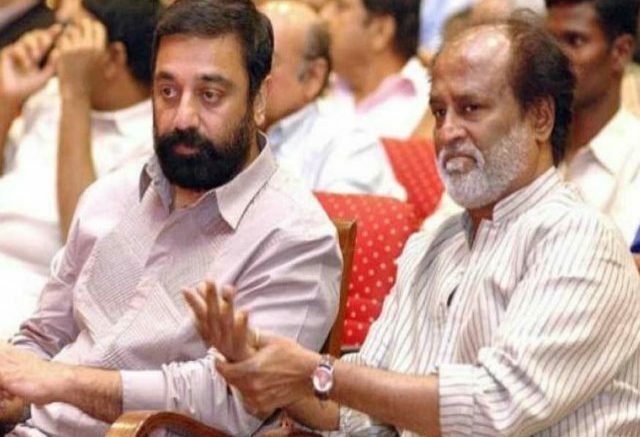 Speaking at the function, Kamal Haasan revealed that he was initially hesitant to share the dais and enquired whether Rajinikanth had agreed to share the stage. On hearing that Rajinikanth will not share the dais with the DMK leader, Kamal Haasan felt like following Rajini’s suit but changed his mind as it is a rare opportunity to sit along with the editors of different dailies and magazine. But the actor said it was not the right occasion to make political statements. Kamal Haasan revealed that he was first invited to join DMK when M Karunanidhi sent him a telegram in 1983. But the actor has not responded to the DMK patriarch’s message till date. However, Kamal Haasan believes that the Dravidian politics, which is unique and restricted to Tamil Nadu, will be here forever. “Many are predicting that Dravidian culture would vanish. But Dravidam (Dravidian culture) would continue to exist till the word Dravida exists in the National Anthem,” IANS quoted the actor as saying. His statement highlights one major point that he believes in the Dravidian politics and he has not accepted Karunanidhi’s offer to join the DMK. With the AIADMK having issues with the actor and Rajinikanth likely to be considering joining the NDA, the actor is left with only one choice – join the DMK as floating a new party has been ruled out by the actor himself due to lack of financial resources and the Congress is not a Dravidian party. Be the first to comment on "DMK Event:Rajinikanth and Kamal Haasan graced the platinum jubilee function of DMK’s mouthpiece Murasoli"